Well, I am currently in my last week of classes before finals and, as usual, I am at the point where my body is running on auto-pilot. The zombie-esque "sleeping-while-awake" state of mind I am currently in is not conducive to lace knitting, but spinning seems to work just fine. 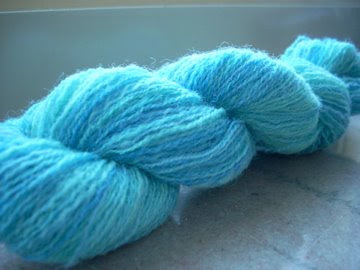 I while ago (weeks in fact, I'm uber behind with posts), I finished spinning my second ply of yarn and then plied my two singles together and got this. I'm still totally in the newbie stage where anything I create, no matter how ugly and terrible, deserves multiple photographs from all angles. I don't have anything to measure weight or yardage, so that is all a mystery to me, but the finished yarn measured about 25 wpi. I would say it's a pretty solid laceweight. 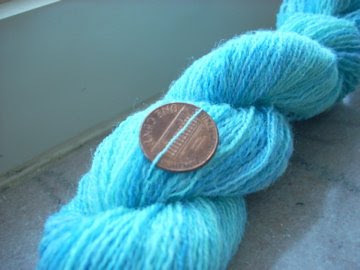 Spinning yarn this thin was definitely a challenge on my 1.7 oz. spindle. I don't recommend it to those who don't enjoy chasing their spindle around the room as it rolls away because the yarn has, yet again, broken. 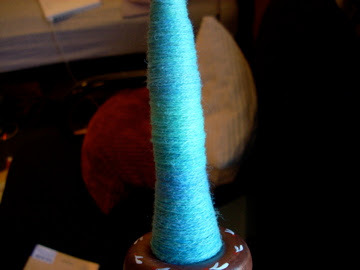 I was definitely testing the extremes of my spindle when spinning this thin. 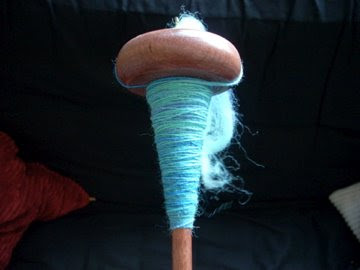 Just for a comparison, the previous 2-ply I spun on this spindle came out to be 11 wpi and it felt very comfortable to spin that thickness on the spindle. After I finished this skein, I actually put my spindle away for a bit because it just took so long to produce anything and sometimes I wasn't in the mood to repair breaks. 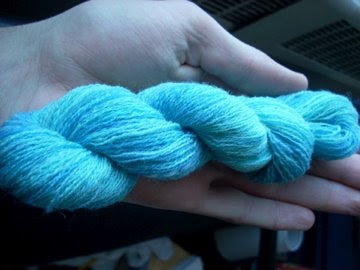 It struck me a few days ago that I could just spin thicker yarn, so that's exactly what I started doing. I'm going to make yet another 2-ply, this time testing the other extreme of my spindle, that is, seeing how thick I can spin without completely driving myself crazy. I've doubled the amount of yarn you see on that spindle since taking the picture this morning and it is going so much faster. I'm really enjoying it again, which is fantastic. ETA: Wil and Jennifer, sorry I never replied to your comments in the last post. In response to them: Wil, there will absolutely be no yellow sweater making in my future, nor Jennifer, will there be a really long yellow scarf, although your idea about the matches is a tempting one. Oh crap, I think I missed someone else too... Ah, TricotChico! MamaFitz posted and told me what the hand pillow is really for. It's for "pressing," which, if I remember correctly, is for if you have to press something like a shoulder seam or armscye that doesn't lie flat, you wear that thing on your hand and then iron on top of it so you don't burn your hand while doing it. Ok, for real. The End. I think your yarn look great! But yes, as you said, lace on that weight of spindle probably isn't the best idea. I'm glad to see you back at it again! 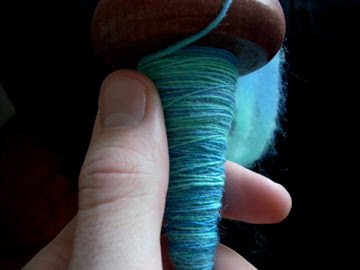 I am still mystified by the whole spinning thing, but enjoy watching your progress. That certainly is a *purty* shade of blue - love it. 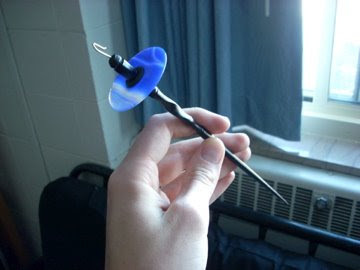 And, nice spindle, whatever its gender. The spinning looks wonderful!! I'm insanely jealous... The new spindle is also lovely. 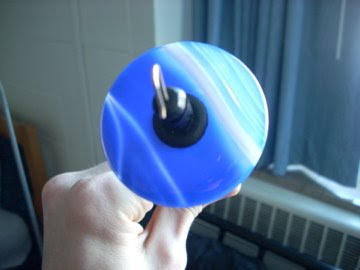 Your spinning looks amazing! I really should get my spindle out and play some more, one of these days.